Transcend Information, Inc., a leading manufacturer of storage and multimedia products, is proud to introduce its bidirectional transmission and storage solution for iOS device users. Transcend’s Lightning offerings, crafted for use with iOS devices, include flash drives for immediate storage expansion, a smart card ready for instant file transfer between Apple devices and memory cards, and exclusive Apps help these devices go far beyond the expected. The JetDrive Go 500 flash drive is one of the smallest MFi-certified flash drives on the market. It boasts a sleek, metallic zinc casing, available in both silver and gold colors, that mirrors the stunning design of your Apple device, while remaining inconspicuous and unassuming. Specifically designed for iPhone, iPad, and iPod, the JetDrive Go 500 combines a Lightning connector and a regular USB 3.1 (Gen 1) connector into a flash drive, providing an ultra-convenient way to back up and transfer files among iOS devices, Mac computers, PCs and laptops. The flash drive enables people on-the-go to quickly access, transfer and store up to 128GB of extra storage on your Apple device. The JetDrive Go 300 flash drive comes in classic black, silver and rose gold to match your iOS device. With USB3.1 Gen 1 and Lightning dual connectors, transferring data among mobile devices and PC is as easy as pie. Other than the Airdrop function, the JetDrive Go 300 is an alternative way to share files with friends when there is no Wi-Fi connection or among different platform devices. Files including documents can be copied or moved to the JetDrive Go 300 without having to connect to the Internet. The RDA2 Lightning card reader expands the possibilities for your iPhone or iPad by allowing you to transfer brilliant photos and videos from your digital camera, do some light editing, and uploading them to social networking sites straightaway. The smart reader, built with a Lightning connector, offers the power to store, transfer and back-up data from card slots for both SD and microSD cards so you can access your photos and videos anytime, anywhere. Fully compatible with all iOS devices, the Transcend RDA2 is an MFi-certified card reader that meets Apple's stringent safety, performance, and manufacturing standards. Transcend’s JetDrive Go 500 is available in gold color with 32GB and 64GB capacities and in silver with up to 128GB capacities; the JetDrive Go 300 is available in silver, black and rose gold colors with 32GB, 64GB and 128GB capacities. 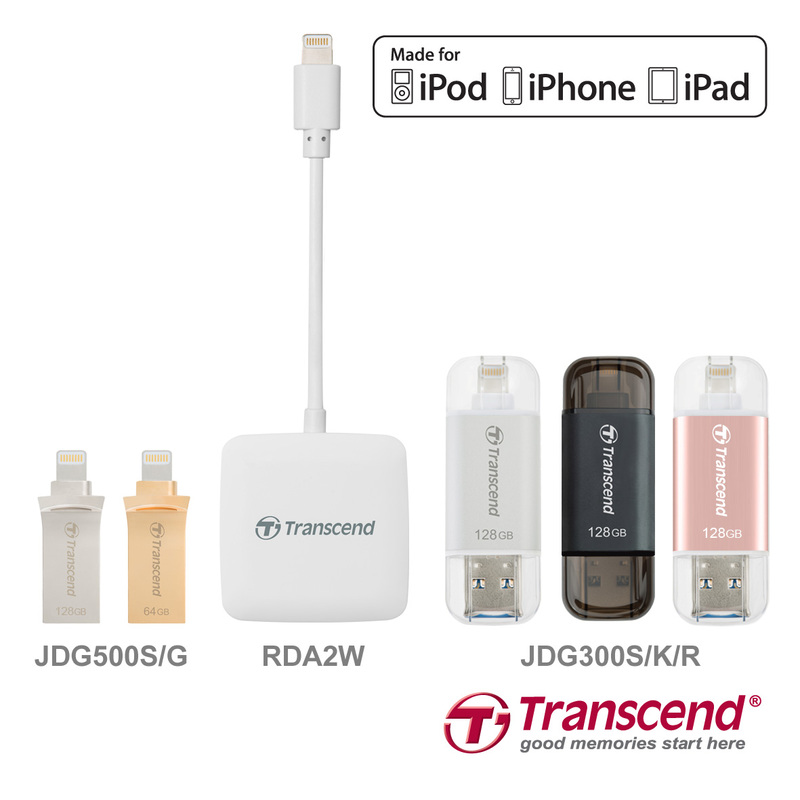 Both RDA2 Smart Reader and JetDrive Go series are backed by Transcend's Two-year Limited Warranty.